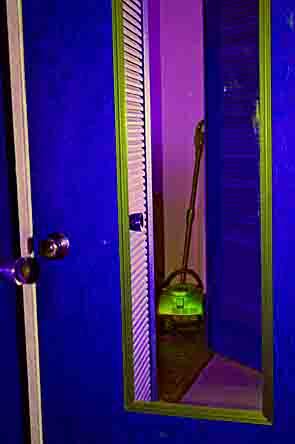 Smith Andersen North Gallery Representing Philip Hyde At Photo L. A.
Stocking, copyright Daido Moriyama. Used by permission of Smith Andersen North Gallery. In keeping with the increasing significance of Los Angeles in the international art market, Photo L. A. 2014 has relocated to the historic L. A. Mart in downtown Los Angeles. Photo L. A. is the longest running art fair West of New York. Photo L. A. organizers are expecting photography galleries and participants from all over the world and the West Coast in particular. The City of Los Angeles will host three major art shows the same weekend. The L. A. Art Show will be held at the L. A. Convention Center January 15-19 and Classic Photographs Los Angeles 2014 will grace Bonham’s on Sunset Boulevard on Janauary 18 and 19. Photo L. A. will offer participants the opportunity to visit the booths of 54 gallery exhibitors, 11 non-profit organizations, six installations and five art schools. 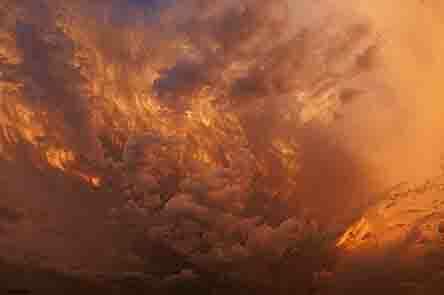 In Booth 308, near the main entrance, Smith Andersen North Gallery of San Anselmo, Marin County, California, will show some of the most sought after photography on the market today. Stefan Kirkeby, proprietor of Smith Andersen North said his gallery will be one of the few galleries exhibiting at Photo L. A. with a primary focus on California and West Coast photographers. However, Smith Andersen North will also show the world-famous Japanese street photographer Diado Moriyama, known for depicting the breakdown of traditional values in post World War II Japan. Kirkeby also said that Smith Andersen North is one of the few Galleries publishing and producing copper plate photogravure prints. Smith Andersen North Lab produces photogravures of the photographs of Daido Moriyama and Malick Sidibé, an African black and white photographer most noted for his portraits of 1960s popular culture in Africa’s fastest growing city, Bamako, Mali. The centerpiece of the Smith Andersen North booth at Photo L. A. will feature Golden Decade photographers, particularly Philip Hyde, Benjamen Chinn and Paul Caponigro. Kirkeby said, “I chose to show Philip Hyde at Photo L. A. to support the upcoming Philip Hyde show at Smith Andersen North. We just finished a show with Paul Caponigro and have exhibited not long ago Benjamin Chinn as well.” One of the hottest contemporary artists today is Klea McKenna, who will also be featured at Photo L. A.. McKenna is a San Francisco based experimental photographer. Tickets to Photo L. A. are $20.00 for one day and $30.00 for the weekend. 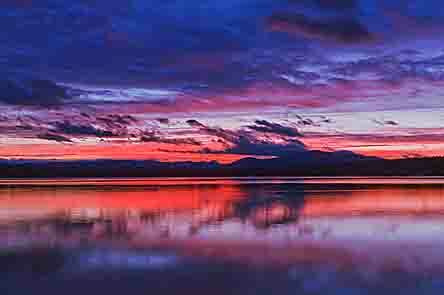 Any Landscape Photography Blogger reader who would like a complimentary ticket to the show, please contact Smith Andersen North Gallery at 415-455-9733 and tell them David Leland Hyde sent you. They will contact Stefan Kirkeby at the show and he will put you on the Will Call List for a free one day pass. 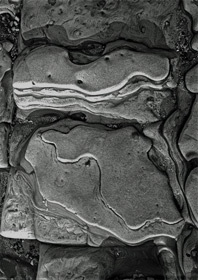 Rock Formations Detail, Weston Beach, Point Lobos State Reserve, California, 1949 by Philip Hyde. 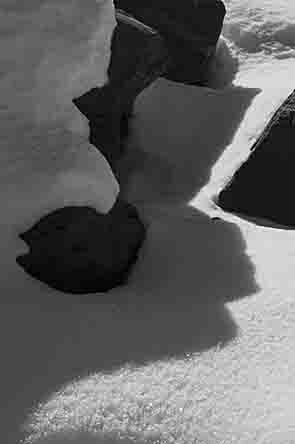 This photograph made by Philip Hyde on a California School of Fine Arts class field trip to see Edward Weston at Wildcat Hill in Carmel and photograph with him on Point Lobos may have been created while Edward Weston was present. A vintage print of this photograph is on consignment at Smith Andersen North Gallery and part of the Golden Decade Exhibition and book. Philip Hyde considered Edward Weston his primary model for a simple life close to nature and dedicated to fine art photography. 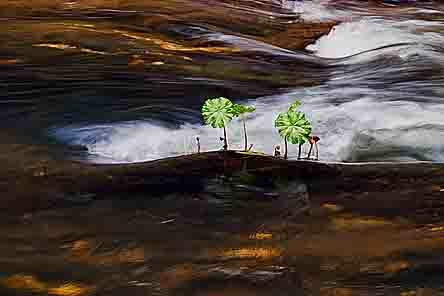 A prominent feature article in the Marin Independent Journal and Contra Costa Times called, “Golden Images: Exhibit Shows Work That Helped Transform Photography Into An Art Form” recently featured Stan Zrnich, a former CSFA student and long-time resident of San Rafael, Marin County, California. Stan Zrnich spoke about the show, his photography and his years as a student at the California School of Fine Arts, now the San Francisco Art Institute, in the late 1940s and early 1950s. The article brought to the event another wave of local guests that grew into another inundation of the Smith Andersen North Gallery as the article was syndicated to other newspapers around the Bay Area. Due to the success of the Golden Decade Exhibition, it will be extended to November 13. Also, the Smith Andersen North Gallery will host a Closing Reception and Book Signing. A handful of the Golden Decade photographers will be present to meet, greet and sign books. If you weren’t able to attend the opening or didn’t get a chance to meet the photographers and get a good look at the work through the crowds, this will be the perfect opportunity to experience the show anew. 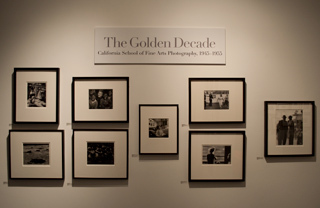 The exhibition was organized in conjunction with the pre-publication release of the book The Golden Decade: Photography at the California School of Fine Arts, written by Ira Latour, Bill Heick and C. Cameron Macauley and compiled by Ken Ball and Victoria Whyte Ball. 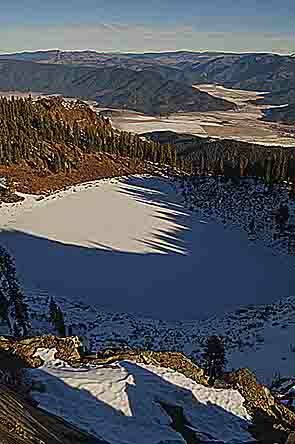 For book inquiries or to reserve a copy (there are about 40 limited edition pre-published books available), please contact Ken & Victoria Ball at 925-373-0173 and let them know you heard about it on Lanscape Photography Blogger. Title Wall, Golden Decade Exhibition, Smith Andersen North Gallery, San Anselmo, California, 2010 by David Leland Hyde. Over 500 people turned out for the Marin County opening reception of the Golden Decade Exhibition and Golden Decade pre-publication launch at Smith Andersen North Gallery in San Anselmo, California on Saturday, September 4th from 6 pm to 9 pm. The first prints from the show to sell in the morning before the opening were Philip Hyde’s 4X5 contact print “San Francisco Piers and Waterfront” and Stan Zrnich’s 5X7 contact print “South Pier, Bay Bridge.” Out of over 150 vintage black and white prints from 32 students at the California School of Fine Arts now the San Francisco Art Institute, over 30 prints sold the first night. Front Room, Golden Decade Exhibition, Smith Andersen North Gallery, San Anselmo, California, 2010 by David Leland Hyde. “There is currently a lot of energy around the work from this period,” said Scott Nichols, a downtown San Francisco photography gallery owner and collector of Scott Nichols Gallery. 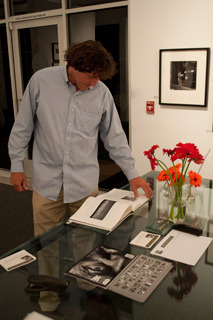 Scott Nichols has the largest collection of Brett Weston in the world. 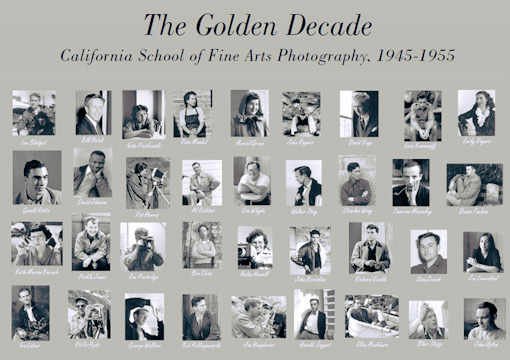 The 32 photographers featured in the Golden Decade Exhibition were students at the California School of Fine Arts after World War II, in the first decade of Ansel Adams‘ photography department when he hired Minor White as lead instructor, Dorothea Lange, Imogen Cunningham and Lisette Model as guest instructors and Edward Weston as field instructor. Former students John Upton, David Johnson and Stan Zrnich all spoke about their experiences at the school and their lives in photography. Stefan Kirkeby, Smith Andersen North Gallery Owner, Sunday Morning After Golden Decade Opening, Smith Andersen North Gallery, San Anselmo, California, 2010 by David Leland Hyde. Stefan Kirkeby finally gets a chance to see a bit of the book. 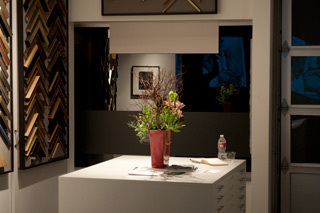 "I'm knocked out," Stefan said after hosting, curating, matting and framing the show in his in-house frame shop. “I’ve never seen so many people at a gallery opening,” said Smith Andersen North proprietor Stefan Kirkeby. “There were people packed into the front and spilling out into the street, in the back and outside on the patio. They went through 250 oysters in two hours.” Smith Andersen North Gallery is equipped with large garage doors in front and most of the front of the building can open wide right onto the sidewalk. The Golden Decade Exhibition, scheduled to wrap up at 9 pm, raged on and finally closed down around 11:30 pm. At around 8:25 pm the surrounding neighborhoods looked as though a concert had just let out. Hundreds of people were moving toward their cars and traffic was snarled in surrounding streets. “It was sardine night,” said Stan Zrnich the next morning. Golden Decade photographers also include Pirkle Jones, Ruth Marion Baruch, Philip Hyde, William Heick, Pat Harris, Bob Hollingsworth, Cameron Macauley, Ira Latour, Benjamen Chinn, Rose Mandel, Gerald Ratto, John Upton and others. 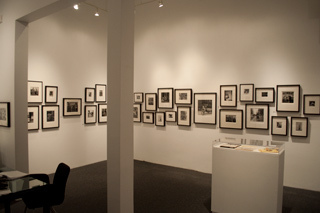 Their work has been represented in important photographic historical events such as The Family of Man Exhibition (1955, New York and international venues) and The Perceptions Exhibition (1954, San Francisco), and many of these photographers were prominently featured in the early issues of Aperture magazine when Minor White was editor. Frame Selection Area, Smith Andersen North Gallery, San Anselmo, California, 2010 by David Leland Hyde. Besides developing a strong following of photography collectors, Smith Anderson North also is a leading framer for major museums in Northern California. Stefan Kirkeby just completed installation of the famous Fisher Collection at the San Francisco Museum of Modern Art. He mats on 8-ply Rising Board with archival hinge mats and hand-made paper corners. The frames are hand-made of poplar, ash and other hardwoods. Wooden frames have a much nicer feel than metal frames, don't catch on clothing or packing materials and are perfect for traveling shows because if they get dinged they can be sanded down and repainted. An 11X14 museum frame retails for $200. 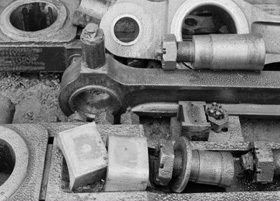 Locomotive Drive Gear Parts, Tiberon Northwest Pacific Railroad Yards, Marin County, California, 1948 by Philip Hyde. This photograph among others in the Black and White I and Photography School Portfolios will appear in the new book, "The Golden Decade: Photography at the California School of Fine Arts, 1945-1955" to be released Tonight, September 4, 2010 at the opening reception at Smith Andersen North Gallery. Also this evening will be a preview screening of the short documentary film, "Looking For My Father Through Ansel Adam's Lens." San Francisco flourished coming out of World War II and grew into the financial capitol of the Western United States. In 1945 Bank of America became the largest bank in the world. Bechtel built Glen Canyon Dam on the Colorado River in the early 1960s, and by the 1970s developed into the largest privately held corporation in the world. Just up the hill from Kaiser, Bank of America, Bechtel, Utah Mining and Construction and others in San Francisco’s financial district, stood the Mill Towers headquarters of what developers called the “enemies of progress,” the Sierra Club. Before the 1950s the Club had only a few thousand members, but in just two decades its numbers soared into the hundreds of thousands. While industrialists and environmentalists squared off, San Francisco also became the West Coast’s creative center. After World War II, discharged veterans were armed with a new domestic weapon, the G. I. Bill, that promised to pay for their education in the trade school or college of their choice. The Jazz age brought a vibrant night life and music scene to the streets and night clubs of San Francisco. Artists from war-torn Europe and elsewhere settled in the Bay Area. The many military bases funneled young men into industrial development and provided labor for an expanding city. Writers and artists took over cheap rentals in Marin County from what had been shipyard housing. 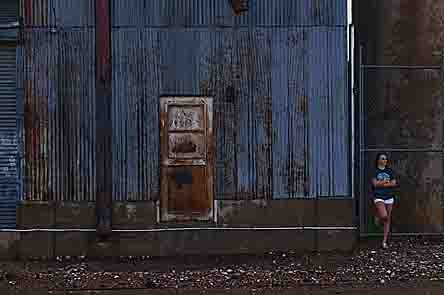 Abandoned barges in Sausalito were converted into homes with roofs and plumbing. The mingling of painters, sculptors, print makers, photographers, potters, graphic artists, metalworkers and other artists transformed Northern California and the world. It was a great time to be a photographer in San Francisco. Their education delayed by the War, many of the photography students were at least three years older than the typical college freshmen. “Most of us were in the service where our lives were on hold,” said San Francisco born student Philip Hyde. “The War taught us a lot that grew us up fast.” Though Philip Hyde’s 15-20 classmates got along well, he said they never talked about the War. “We were enthusiastic about our new lives and wanted to leave the past behind.” They were serious, yet “happy to be free” and enthusiastic to pursue such an outstanding opportunity in San Francisco, the post-war hotbed for the incubation of young artists. The photography students were all highly dedicated. One student, Al Richter, always carried his camera, even at the parties. Al Richter took pictures of each class member and gave them prints. “That was John Rogers cracking the jokes,” said another classmate Benjamen Chinn. “I know how to Joke but I don’t talk as much as John Rogers. John was the one that always teased Minor White. Al Richter was quiet but had a dry sense of humor.” With the humor, positive outlook and time spent together, many of the class members became life-long friends. 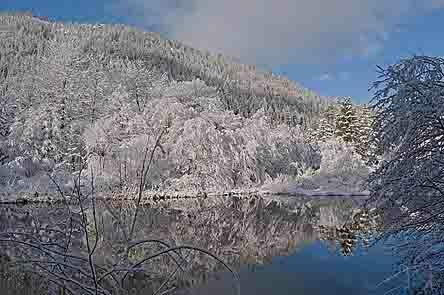 Al Richter and Benjamen Chinn called Philip Hyde after he moved to the mountains for the rest of their lives. 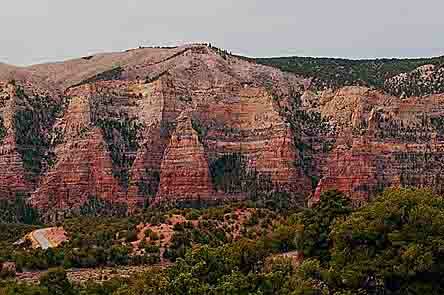 They drove the five hours from San Francisco to Philip Hyde’s home in the wilderness in 1958, 1959 and 1961. “Al took his vacation and my vacation didn’t matter, I could take it any time,” Ben Chinn said. 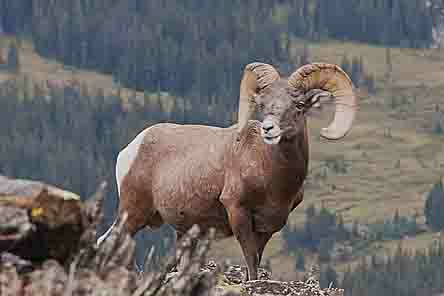 “Two or three years in a row he wanted to go up and visit Philip. He did the driving and I just rode along. Al might have had a plan, but I never knew it. He never told me where we were going. It was for the best.” They traveled equipped with 4X5 Baby Deardorffs on wooden tripods. They had a rule that if either one of them saw a picture they would stop and photograph for a while before going on. 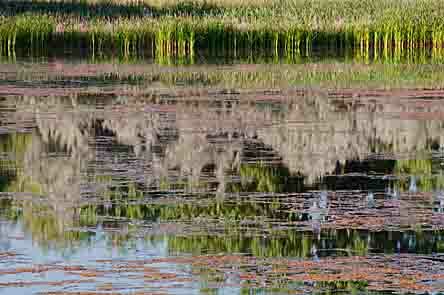 “Paul Caponigro went with us one of those trips,” Ben said. Paul Caponigro was a photographer friend of Ben’s that he introduced to Ansel Adams, and who subsequently became renowned in his own right. 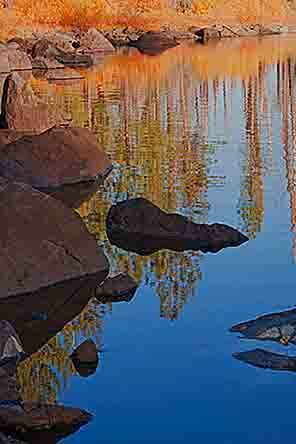 Benjamen Chinn had been a photographer since age 10. He did aerial reconnaissance photography during the War. Ben started in September 1947 just like Philip Hyde, but left in the middle of 1949 to go to art school in Paris. Benjamen Chinn attended the famous Art School at Sorbonne, University of Paris. He also hitch-hiked all over Europe and in time traveled the world. For many years he worked for the U. S. Department of Defense establishing and overseeing its color photo lab in San Francisco for many years.